Omladina was a Czech nationalist youth organisation created in the 1890s. The group was defined by its anti-Austrian and anti-clerical tendencies and contributed to the nationalistic revival that was gathering momentum at the turn of the century. In 1904 the leaders were arrested, prosecuted and sentenced to prison. Mucha chose to depict the group of youths kneeling in a circle and holding hands as they pledge allegiance to the goddess Slavia. Slavia sits in a linden tree behind, a symbol of divination. The children are surrounded by members of patriotic and political organisations, and beyond them sit figures dressed in folk costume representing the Czech people. In the foreground, sitting either side of a wall, are a male and female figure modeled on Mucha’s children Jaroslava and Jiří. The girl strums a lyre – an image later used on a poster to promote his 1928 exhibition at Prague’s Trade Fair Palace – while the boy sits behind his mother as he listens to the music. 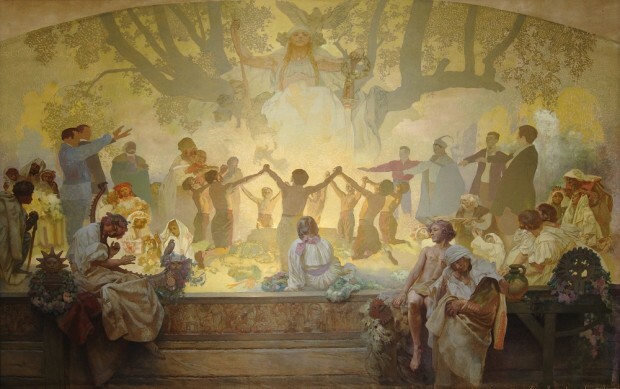 With the Oath of Omladina, Mucha brought his Epic up to the end of the 19th century. However, the composition was never completed and several figures remain in egg tempera without an oil finish.